For the last couple of years, an exam question I have set my undergraduates is ‘How do proteins differ chemically from lipids and carbohydrates?’ The answer is: While carbohydrates and fat contain Carbon, Hydrogen and Oxygen, proteins also contain nitrogen. For this reason, we can use measures of nitrogen in the body to assess the adequacy of an individual’s protein intake. Nitrogen balance does not necessarily mean someone is taking in the same amount of nitrogen as they are using. Nitrogen balance is simply the measure of nitrogen output subtracted from nitrogen input. Therefore, if someone is taking in less nitrogen than they are excreting they are said to be in ‘negative nitrogen balance’. A negative nitrogen balance is associated with malnourishment and/or overtraining i.e. catabolic processes are overriding anabolic ones. Conversely, a positive value is often found during periods of adequate and particularly over nutrition as well as when resistance training acts as a stimuli for nitrogen/protein accrual. The figure below shows the possible fates of protein and therefore nitrogen in the body. Measuring nitrogen balance is at best, an estimation of both intake of nitrogen and excretion. Because of the incorporation of nitrogen into urea as shown in the figure above, loss of nitrogen is usually measured using urine, faecal and sweat nitrogen content. Losses may also occur through exhalation although, during exercise the errors in this measurement make it unreliable. Other issues have been found such as one identified by Wolfe et al. (1984) who found that light exercise increased the oxidation of leucine without increasing urea production. If this is the case, then protein needs for maintenance of muscle tissue may be underestimated. Other techniques which are perhaps more accurate use tracer techniques which use radioactively labelled tracers that are either ingested or infused. For instance, by infusing an amino acid with a radioactively labelled carbon, hydrogen, or nitrogen atom into an individual it is possible to measure the amount that is needed to get a balance with the amount being excreted. It is then possible to measure whole body amino acid oxidation and degradation by measuring the amounts of radioactive carbon or nitrogen in the participant’s breath or urine. A very new technique is now being employed in a number of studies to look at protein requirements. This method is called the indicator amino acid oxidation (IAAO) method. Here is a little explanation of it by Elango and colleagues (2008) who have done a lot of work in this area since, some of which we will discuss later. If you didn’t get that, try this analogy. We have a nightclub (your muscle) that has quite a lot of men in it (muscle fibres) so the doormen stop letting in guys (indicator amino acid) into the club. Therefore there is an excess of guys outside the club who can’t get in so they get oxidised (couldn’t think of an analogy for that one… feel free to give suggestions!). However, if a guy is with a girl (indispensable amino acid) then they are complete (protein) and can get into the club… so! If we get a coach load of girls to come down and each one goes in with one of our excess guys we get less oxidised guys outside and more incorporation into the club! (MacDonald, 2011). Hopefully you followed that. This really makes sense if you know anything about complete and incomplete proteins. On top of this, we see that foodstuffs higher in leucine give us a lower (good) IAAO. 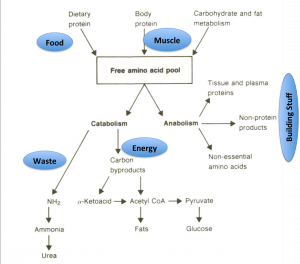 Studies using the IAAO method have shown that casein has a higher metabolic availability (MA) than soy protein (Humayun et al, 2007) so it must be a good method right…. ? Studies using the IAAO method are finding errors in old studies using other methods and the results are seemingly supporting what strength trainers have known for years. We’ll look at these later. There are many things that will affect nitrogen balance and how much protein is needed to maintain this. Two major factors are energy intake and carbohydrate status. The reason I have included this section is so that based on your situation you have an idea of whether perhaps your protein needs are elevated. Very often I see individuals who want to gain muscle, however, they still train for and play football 2-3 times per week. At the same time, they might be trying to get lean for a holiday so they have reduced carbohydrates, sometimes drastically, because they are following some internet craze diet. In these instances, with energy expenditure being high and carbohydrates being low or simply not high enough because of the high intensity exercise, protein needs are drastically increased. Below is a figure adapted from Lemon and Mullin (1981) that shows sweat urea nitrogen (mg/h; a measure of nitrogen loss) in 3 different conditions. As you can see, nitrogen losses with low muscle glycogen levels are hugely increased. One thing to note here is that if an individual is very well fat adapted, I would expect to see a blunting of this nitrogen loss which signifies amino acid oxidation. Clearly different people have different goals and training modalities. This means recommendations for protein intake will vary accordingly. While strength and power trainers may want to increase muscle size and therefore, want extra protein for muscle growth, endurance trainers actually break down a far greater amount of protein and have increased needs also. Something I have to tell endurance athletes, especially females, time and time again is that eating protein is not going to make them ‘bulk up’. Similarly, I spend a lot of time trying to get endurance athletes to understand that consuming protein immediately after training is beneficial not because it will ‘rebuild their muscles’ but because it will stimulate synthesis of new enzymes (proteins) and mitochondrion (also proteins!) which is part of adapting to training! As I have previously covered, older studies, employing less accurate measures of nitrogen balance may need to be discarded from future meta-analysis. Similarly, studies that only look at maintaining nitrogen balance, do not give us an indication of the optimal protein intake for muscle gain! Very often studies are trying to ascertain the minimal protein requirement to maintain nitrogen balance however, this clearly does not equate to an optimal protein intake. Strength athletes/trainers and bodybuilders are often interested in muscular hypertrophy, which will require intakes well beyond levels required for maintenance. Interestingly, there is evidence to suggest that nitrogen balance may be able to occur at protein intakes that fall below those needed to optimize body composition and performance measures. A commonly cited study is the one shown in the figure below. Gontzea et al (1975) showed that when individuals undertake a new, unfamiliar, training schedule they go into negative nitrogen balance very quickly but that after about 2 weeks this normalises. The training used here was more endurance based and therefore, we still do not know what the difference would be if resistance exercise was used or if muscle hypertrophy was the goal. As mentioned earlier, new techniques are becoming available to assess the adequacy of protein intakes. Elango et al (2010) published a paper titled “Evidence that protein requirements have been significantly underestimated” in which they use the IAAO method to show that daily protein requirements are being grossly underestimated by other methods and that “there is an urgent need to reassess recommendations for protein intake in adult humans.” In this study they found requirement value should be nearer of 1.2g/kg per day for sedentary individuals. Therefore, it is safe to assume if this technique is used to assess athlete’s needs, the recommendations might be higher. Currently the guidelines for exercising individuals are based on information in a paper by Lemon (1996). Recommendations for those who engage in regular endurance exercise are 1.2-1.4 g protein/kg body mass/d and for strength exercisers, 1.7-1.8 g protein/kg body mass/d. Therefore, in coming years, we may see these recommendations going up to match what strength athletes are instinctively using which seems to be around 2-2.5g/kg. In my opinion, in non-drug using trainers, intakes of 1.5-2g per kilogram are well in excess of what is needed. Very high intakes of protein simply lead to a greater breakdown and production of urea (waste product) whereas with normal, optimal, intakes of protein the salvage of urea via urea hydrolysis, is more efficient (Fouillet et al., 2008). Again, the reason I include this is that many people ‘cross train’ in the sense that they both run, cycle, play football and weight train all in the same week! Some say that eating a very high protein diet produces a beneficial anabolic hormonal environment and it is this reason individuals should consume more than is recommended by experts. However, this does not seem to be the case and in fact, eating too much protein at the expense of carbohydrate may well reduce the body’s levels of anabolic hormones such as testosterone. A study in 2007 by Ormsbee and colleagues also looked at the effect of increased protein intakes on levels of IGF-1, IGF-I, IGFBP-1, and IGFBP-3 which are hormones involved in muscle building. Intakes were 50 g, 100 g, or 200 g and showed no differences in serum concentrations of any of the hormones. However, what was noted was that the 50 g/d of protein resulted in a negative nitrogen balance, whereas 100 g/d and 200 g/d resulted in a positive nitrogen balance with 200g/d being significantly greater than 100 g.
For the individuals using appropriate training methodologies to gain muscle, including periodization of this training, protein intakes of 2-2.5g/kg seem appropriate. If using supplementation such as creatine, leucine and whey protein, the protein needs may well be increased above normal because of the increased ability to stimulate protein synthesis and other anabolic processes. It is also useful to note that some form of protein cycling may be beneficial. So that when a new block of training is started, more protein is consumed. Also, when energy intake or carbohydrate intake go down, protein intake must go up concomitantly.